CD Label: Mfg. by Bandai Visual Co. Ltd. 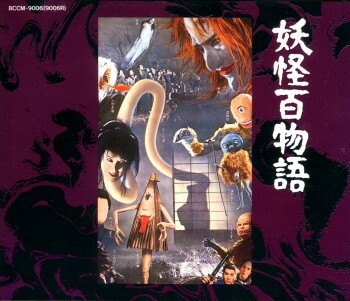 This 2-CD set collects the soundtracks from two of Daiei Studios ghost films, "100 Monsters" (aka "100 Ghost Stories", 1968) and "Along With Ghosts" (aka "Journey Along Tokaido Road", 1969). I don't know too much about these films - they were apparently released in the U.S. but are rarely seen today. "100 Monsters" takes place in 18th century Japan and involves a storyteller whose ghost stories come to life, punishing a greedy landowner for opening a brothel in an old religious shrine. The film was successful, with imaginative special effects, and quickly spawned two sequels. "Along With Ghosts" is the second of these, a tale about a little girl who travels along a haunted road in search of her long-lost father (an earlier sequel, "Ghosts on Parade", is not featured on this set). The music for both of these movies is suitably eerie and mysterious, but there are also extensive portions of Japanese dialogue inserted between nearly every musical cue, and I found this to be distracting. Still, both scores feature an interesting variety of music, and may appeal to horror buffs as well as collectors of Japanese fantasy soundtracks. This is a literal translation from YOKAI HYAKU MONOGATARI. A 'yokai' is a ghost or spirit in non-human form, like an object such as the Umbrella Ghost and Lantern Ghost featured in the movie, or a bestial or demonic creature. A spirit in human form is referred to as a 'yurei', such as the ghost of Oiwa in the YOTSUYA KAIDAN dramas.